New York, NY – The London NYC Hotel – October 9, 2015 – MartinLogan, the world’s leader in electrostatic and Folded Motion™ loudspeaker technology, proudly announces two new products to its ensemble of luxury wireless audio products: a wireless stereo bookshelf speaker, Bravado, and a wireless amplifier, Forte. Utilizing Apple AirPlay and DTS Play-Fi technology, these exciting new wireless products provide listeners the freedom and flexibility to stream their high-resolution music (up to 24-bit/192 kHz) wirelessly over an existing Wi-Fi network. DTS Play-Fi is a uniquely open platform, meaning listeners are able to mix and match from any DTS Play-Fi-enabled audio products from a selection of top audio brands. In addition, MartinLogan’s wireless products do not limit the listener with the need for proprietary hardware; they can use the Forte wireless amplifier to power and stream audio to traditional or in-wall/in-ceiling speakers, no matter the brand. As an added bonus, Bravado and Forte also feature Apple AirPlay functionality. With the inclusion of AirPlay along with DTS Play-Fi, listeners can take advantage of endless choices, from their own music libraries to online music streaming services. And they can stream their music from any device—Android, iOS, PC or Mac. Bravado and Forte performance is further enhanced by exclusive Anthem Room Correction (ARC) technology – included with both products. ARC Technology is the industry’s best user-controlled DSP room tuning innovation. Using advanced DSP software and a calibrated microphone, it instantly tunes speaker performance to compensate for your room’s unique characteristics, ensuring perfect sound in any listening space. Recognized for blending science with art, MartinLogan designed the Bravado to fit into any décor. The clean and modest design approach of the black or white cloth exterior is complimented by an artistic accent on top of each speaker— walnut on the black cloth finish and gloss white on the white cloth finish. Side-mounted controls allow the user to easily adjust volume, select inputs, and power the speaker on or off. Under the cloth exterior, Bravado hides dual audiophile quality Folded Motion™ tweeters and a 5-inch aluminum woofer capable of reproducing sound with unflinching accuracy, resolution, and detail—the inspiration behind every MartinLogan design. The signature Folded Motion tweeters utilize extremely low mass diaphragms that "squeeze" air, and require significantly less excursion than the typical 1-inch dome tweeter, which drastically minimizes distortion while providing a lightning fast response time. The increased surface area also provides a wide, yet controlled sound dispersion to create a realistic and carefully etched sound stage. Fully powered, Bravado benefits from a powerful 200W peak Class-D Amplifier (1 x 100W woofer, 2 x 50W Folded Motion tweeters). MartinLogan’s Forte amplifier allows listeners to instantly stream high-resolution audio to any traditional loudspeakers or in-wall/in-ceiling speakers – no matter the brand. And thanks to its compact size, sleek industrial design and brushed black aluminum trim with on board controls, you can place it anywhere you would an amplifier, even proudly on a bookshelf. Like the Bravado wireless bookshelf speaker, the Forte wireless amplifier benefits from a powerful and robust 2 x 200W peak Class-D amplifier (2 x 100W RMS per channel into 4 ohms). The rear panel includes RCA analog inputs, Ethernet 10/100, USB (for firmware updates) and L/R speaker 5-way binding posts. Bravado, priced at $699.95 (US MSRP), and Forte, priced at $599.95 (US MSRP), will begin shipping December 2015. AirPlay and iTunes are trademarks of Apple Inc., registered in the US and other countries. For DTS patents, see patents.dts.com. Manufactured under license from DTS, Inc. DTS, Play-Fi, the Symbol, and Play-Fi together in combination with the Symbol are trademarks of DTS, Inc. DTS and Play-Fi are registered trademarks of DTS, Inc. © DTS, Inc. All Rights Reserved. Since 1983 MartinLogan has handcrafted high performance electrostatic speakers. Their award-winning designs, advanced technologies, and outstanding customer service have long made MartinLogan’s amazingly detailed speakers a must have for home theater and music lovers around the world. Located in Lawrence, Kansas, MartinLogan’s dedicated in-house design and engineering team carefully creates each speaker to provide unparalleled sound reproduction along with industry leading aesthetics. 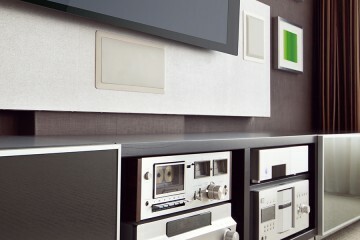 To learn more about MartinLogan, visit martinlogan.com. Since 1993, DTS, Inc. (Nasdaq: DTSI) has been dedicated to making the world sound better. Through its pioneering audio solutions for mobile devices, home theater systems, cinema and beyond, DTS provides incredibly high-quality, immersive and engaging audio experiences to listeners everywhere. DTS technology is integrated in more than two billion devices globally, and the world’s leading video and music streaming services are increasingly choosing DTS to deliver premium sound to their listeners’ network-connected devices. For more information, please visit www.dts.com.